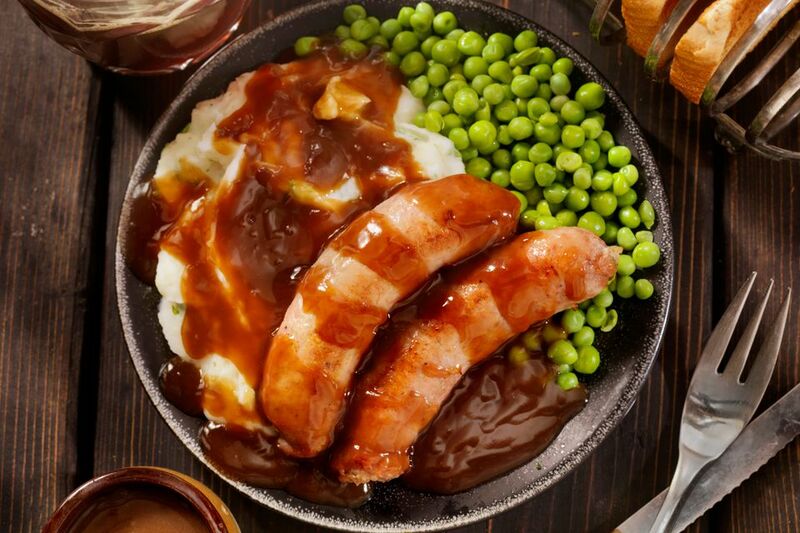 In the UK, millions of sausages are eaten every day and in many ways–grilled, fried, baked, barbequed, in sauces, with gravy, mashed potatoes, or super-delicious bangers and mash, in a sandwich, on a breakfast, and so on. What makes a good sausage? Cumberland Sausage: A hefty, chunky sausage that's easily identified, as it comes in a continuous spiral. Usually bought by length, not weight. Spiced with pepper, this a flavorsome sausage, and an excellent all-rounder. Gloucester Sausage: As the name implies, it is made with Gloucester Old Spot Pork, nicely flavored with sage. Lincolnshire Sausage: All herby and meaty, often heady with sage and sometimes a little thyme. Manchester Sausage: A herby sausage containing cloves, ginger, nutmeg, mace, and white pepper. Marylebone Sausage: Expect mace, sage, and ginger in this traditional London butcher's sausage. Oxford Sausage: Savory with sage, a touch of marjoram, lemon pork and veal–a nicely refined sausage. Pork and Apple: The apple in this pork sausage opens itself up to using cider in the mix, thus creating a lovely moist sausage much loved in the West Country. Square Slicing Sausage: aka Lorne Made from a mixture of pork and beef. Conveniently, this sausage sits very well in a sandwich and is often found on the breakfast plate. Suffolk Sausage: Coarse sausage not unlike a Lincolnshire. Tomato Sausage: Always a favorite with children with a distinctive red color and light tomato flavor. Yorkshire Sausage: Expect a sausage spiced with cayenne, a pinch of nutmeg, white pepper and mace. If possible, buy your sausages from your local butcher, and preferably one who makes their sausages, as they will be made on a regular basis and require less of the preservatives used in mass-produced ones. Buying your sausages locally means you have a better say in the quality, and can maybe request specific ingredients to your liking. As sausages are so versatile, there are many ways to cook them. Bake, barbecue dry—even poached—but whichever way you choose, cook them slowly. Should you cook them too fast, they will not only burst, but the skin will also burn before the middle is cooked. As mentioned above, when cooking sausages, they must be cooked slowly or they will burst or bang. Hence the name bangers, the habit of sausages bursting with a bang when fried too quickly.